All of them should stay out of any sort of decision making for foreign countries. William wanting to be the one to bring about peace in Israel was downright embarrassing. They should not even talk about it. Hary left for Africa on the 25th November with Heather Wong. ^according to this chap, it’s not an official trip. It sounds like Harry was always scheduled to go alone and Meghan’s gaslighting just like she did with his other event when he alone met with youth to deal with the knife crimes. 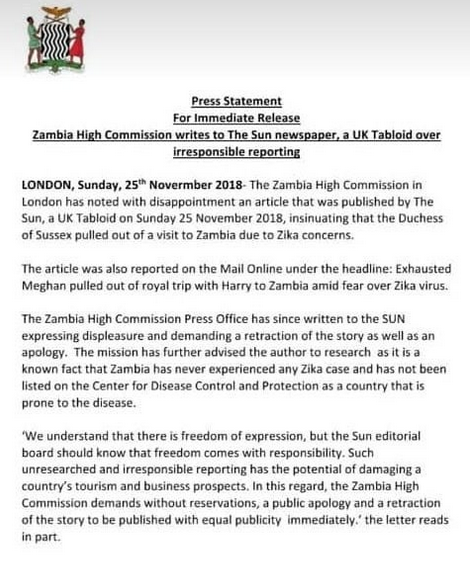 The Zambian government isn’t amused with the Zika articles in the British press due to Meghan’s lies to them. The reports about Meghan going IMO were gossip. The royals set things up well in advance. The fun-loving royal looked typically dapper in a navy blue two-piece suit finished with a crisp white shirt and olive-green tie. He looks professional and pulled together and happy. ^He sure does look professional and happy. Just imagine if she were there, she would be holding his hand while cradling her non-existent bump as he is ordering a juice and staring at him with goo-goo eyes, ugh. Neither KP nor Meghan claimed that she wasn't going to Zambia because of the Zika virus. Neither of them claimed that she was going at all, ever. The announcement from KP stated that Harry was going on a mini-tour to Zambia for two days at the request of the FO/CO. Meghan was never mentioned. And it was followed by another tabloid, the Sun, claiming a couple of days ago that Meghan wasn't going because of this virus. So it was this tabloid who made up the story and it's the tabloid who printed it who will have to retract it. The Zambian government isn't happy about this made up garbage by the Sun. Whatever's going on created an nternational incident. KP has said nothing to clear up the matter as far as I know, so the ownership of tis mess is n Meghan's door. She likes to incert herself where she's not wanted. Chris Ship on the matter. The complaning about the UK media now's funny because her fans had no issues when they reported all kinds of articles that were faverable to Meghan and selling this tacky romance. Meghan again said nothing about this trip. Neither did Harry. Why does KP have to comment? It was the Sun who made up the story about Meghan not going because of Zika. Harry, Meghan and KP said nothing about her going in the first place. If the Sun journos want to exercise their vivid imaginations and in doing so offend other countries then they will have to wear the consequences and retract this fairy tale. Chris Ship is a head of ITN and is just commenting on the made-up Sun story. ^^^^ &^^^^^ I haven't seen that relaxed and happy looking in awhile. His whole aura is different. MeAgain probably didn't want to compete with a rare rhino. There are three, and a horn, in this marriage. Guess MeAgain's American PR team never heard of it, so of course she wouldn't go. Probably thought Zambia was a new clothing line from Kourtney Kardashian or a new action hero. Because the story came from Megs. It will be interesting to see if the tabs continue to print whatever Megs feeds them as a way to expose her, or if they will stop and her PR dries up. Either way will be fun. I don't see that at all. He looks happy with Meghan. He'd have to have multiple personality disorder if he married her being repelled by her. ^ You have eyes.... look he is smiling with a glint in his eye .and relaxed. Just because he wanted to marry her doesn't mean it is good for him. I appreciate Diana for what she brought to the world in terms of awareness, charity but she had mental problems and it has been suggested BPD which she certainly had some characteristics. And in those boys lives, there were blow ups and drama scenes and such hostility between parents. My God she had Bulimia and tried to cut herself and commit suicide or at least injure herself when pregs with Wills. MeAgain may bring up that emotional volatile feeling they had going on in the background which had to be there. And the trauma of losing their mom and wanting to fix it. MeAgain or the Murks as I like to call her, may be attractive to him on a negative level. He has the chance to fix it for mom who was misunderstood, outspoken, a changer and a drama queen in the palace and in the press as well when Diana let it rip. I remember well. Diana has transgressed in death her humanness to sainthood in people's opinions and as a martyr. But she had severe emotional flaws. So does MeAgain but in a bad toxic way. Harry could well be attracted to that on a subliminal level. But it is not good and it shows in many photos. This is just my opinion but if you objectively look at Diana, I can see why Harry is drawn to M but it may not be in his best interest in the long run when the emotional issue come out. Something would have to be really wrong with Harry if he looks "happier" without his wife. He married her and if he felt this relief, he would be a hypocrite. Diana had no mental problems. She did not have BPD. She had Bulimia Nervosa that she got under control. Why the Diana bashing, lesken? And it does belong on another thread. What does this have to do with Harry's engagements. Diana was very well liked because she ADMITTED she had flaws. I think Harry and William learned NOT to be like their father. Thank heavens. ^well something’s wrong because he looks extremely happy without her. Hopefully answers as to why he married her will be revealed soon. I believe the real reason is to use her to play the race card on her as she did on Harry and that the marriage isn’t legal, IMO of course. In a speech during the visit, Harry touched on his wife's absence saying that Meghan sends her 'very best wishes'. Part of the speech: I know my wife, Meghan, had a wonderful meeting with Angeline Murimirwa from your team this past spring, and sends her very best wishes to you all. Meghan is not pregnant. Zambia doesn't have the Zika virus. And Meghan happily visited Fiji and Tonga who do have the Zike virus. I bet Harry loves being away from her. There’s suggestions that Harry might stay longer in Africa after this trip ends. I hope he does as the press continues to finish off Meghan’s image and expose the grifter for what she really is. She has a visa with the right to stay but not to abide meaning that she’ll need permission to enter the U.K. when she leave as well as required to renew her visa in the States if i’m not mistaken. Her time should be up this month then. Anyway, it’s good to see Harry really smile again. With a baby on the way, he's not going to dump her. Maybe he's peeved at the DM making trouble. 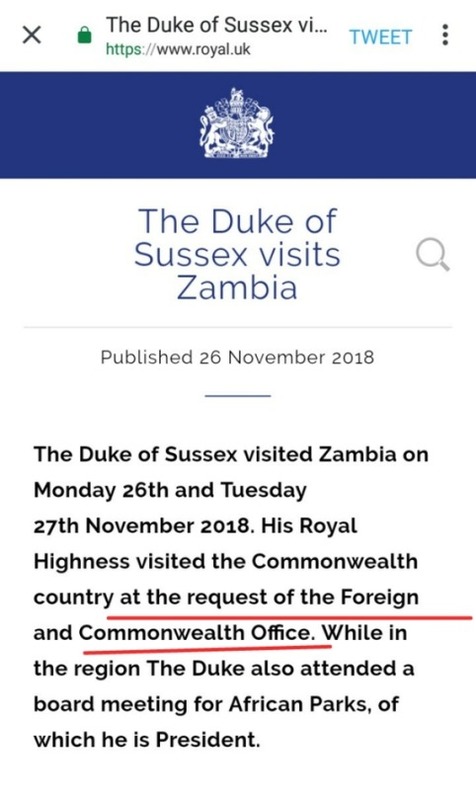 The Duke of Sussex visited Zambia on Monday 26th and Tuesday 27th November 2018. His Royal Highness visited the Commonwealth country at the request of the Foreign and Commonwealth Office. While in the region The Duke also attended a board meeting for African Parks, of which he is President. I think a line has been crossed now that someone has openly said that Meg isn't pregnant.